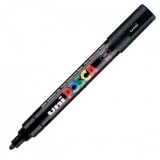 Uni POSCA PC-5M medium bullet tip is the ‘multi-purpose’ member of the POSCA range. POSCA PC-5M's medium tip is the true multi-purpose choice. Ecological. Made from 41% of recycled materials. 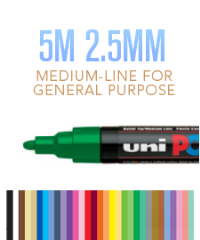 Medium Bullet tip 2.5 mm line width. Individual Light Green ink colour marker. Individual Beige ink colour marker. Individual Red Wine ink colour marker. Individual Bronze ink colour marker.